Back to basics: Kitchen utensil essentials for healthy eating. So here’s the thing. I don’t speak to a client and say, ‘No, you shouldn’t be eating that. You need to eat this’ and they go on the merry way to a healthy and happy lifestyle. Let’s be realistic here. It does not work like that. What is this person’s cognitive capacity? Do they have the skills to cook a healthy meal? Do they know what constitutes a healthy meal? How much money do they have? Who do they live with? Do they cook? Do they have a stove? A microwave? Do they even have a pantry? What hours do they work? Like I’ve said before, and no doubt will say it again. There is no one size fits all approach to nutrition. If you can’t afford the grass fed organic varieties, it’s not the end of the world. Your grain fed beef is still a whole lot better than opting for a frozen pizza. And you don’t have to eat chia seeds, activate your almonds & use acai berry powder in your smoothie bowls. Hell, you don’t like smoothie bowsl? Well it’s lucky your two weet-bix, low fat milk and sliced banana is just as good. Maybe even better. So I may have gone a little off tangent. My intention is to point out that there are a lot of factors that affect the food purchasing, preparation and consumption. Looking at your kitchen is a really good start. What do you have to cook with? When I moved to my brothers during placement last year, I was shocked to find he didn’t have a can opener. Yes, seriously. I couldn’t open my beetroot & I refused to buy one for his house. Anyway. This post was going to be my first post for 2015 – the first step to getting on track, but it got a little displaced. Can you believe it’s almost February already? I’m almost twenty four. Oh dear. Anyway. It’s time to look at the kitchen and I believe these utensils are essentials for for healthy eating. Why? Because I still remember my home economics teacher saying if I was building a kitchen from scratch, I would definitely ensure I have a whisk. They come in handy for eggs, and pancakes. I have also realised that I no longer have one. Oops. Not just for carrots in our salads or cheese on our spaghetti Bolognese. But for the love of fritters, zucchini slice, hiding vegies and carrot cake porridge. I find the vegetable peeler really good for slicing thin slices of cheese (hello portion control). It is also fabulous for snazzy-ing up your salads with zucchini or carrot ribbons. And then you could go to the next level and use it to curl chocolate for a birthday cake. As a student and cooking for one for a very long time, I despised large saucepans. They waste too much water, and take ages to boil. So the small saucepan is just the bomb. Easy to make porridge for one (lets face it, stove top oats are so much better), and to boil a couple of eggs for your salads. And they can be even used to make enough water for a cup of tea when your housemate moves out and takes the kettle. If you are contemplating delving into the ancient grain world, definitely get on of these. Prior to cooking quinoa and freekeh, you must rinse the grain. This removes the natural coating which often tastes bitter. Also, rinsing canned kidney beans, chickpeas and four bean mix reduces the sodium content and gets rid of the gunky looking solution in the can. Gone are the days for the need copious amounts of butter and oil in cooking. Now we can save those unnecessary kilojoules for more important things, like a glass of red wine or a square of lindt dark chocolate. Don’t be afraid to weigh your food. Get to know what a serve of red meat looks like. Like measuring cups, they are an easy way to keep an eye on your portions. To cut vegetables, dice meat and and really, just function effectively. Knives. When I housesat last year, I sent my beautiful red food processor on a holiday to my mums. Whilst the food processor is a fabulous appliance and if your budget allows it, do invest in one, I began using a stick blender. Small, easier to clean and they make making smoothies, pureeing sweet potato for brownies and soups just so easy. I picked one up for under $20 from Coles. It does the job. Plural. You need more than one chopping board. It is especially important when making a dish that that has both cooked and raw components. Such as chicken with my fennel & apple slaw. An essential when you are food prepping. Stock up on some good quality plastic containers and it will make taking lunch to work a breeze, and allow you to make up big batches of food for the week ahead to freeze and refrigerate. I also like having small containers that I can put in open cans of tuna, baby corn, tofu, and breakfast on the run. I feel like I use this every day. I am adamant about getting all traces of my smoothies and blended goods out of the container. 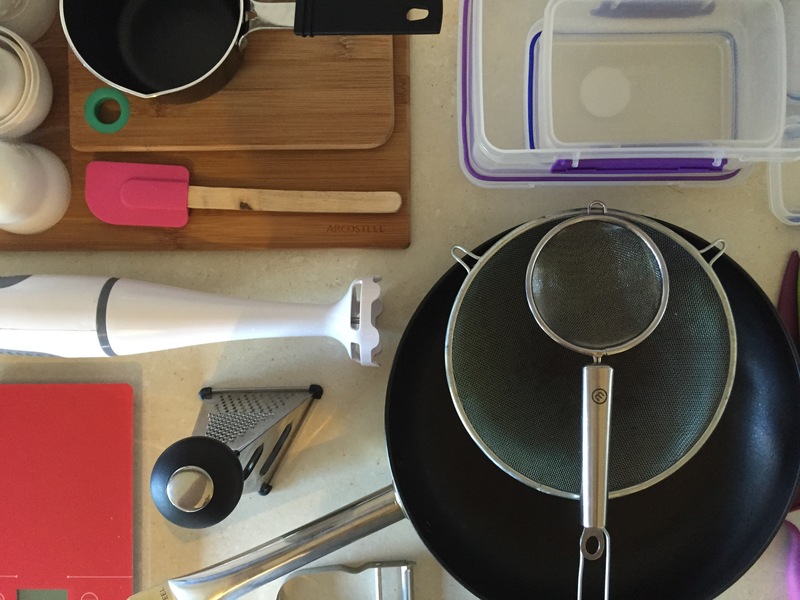 What are your kitchen essentials? Have I missed any? < Make friends with salad: seven summer sensations. oh – and a wooden spoon!